lt;stronggt;SPG19128lt;/stronggt;lt;BR/gt;Simple Green All-Purpose Industrial Cleaner/Degreaserlt;BR/gt;Strong yet safe cleaner removes oil, lubricants and grime from washable surfaces. Rinses easily. Concentrated dilutes with water. For pressure washing and steam cleaning, maintenance. Safe for food-preparation areas. Exempt from OSHA and EPA special handling and personal protection requirements for hazardous materials. Nonabrasive and nonflammable. Application: Machinery Tools Applicable Material: Metal.lt;BR/gt;lt;BR/gt;lt;stronggt;RAC76938EAlt;/stronggt;lt;BR/gt;Simple Green All-Purpose Industrial Cleaner/Degreaserlt;BR/gt;Solves odor problems not only in the air, but also at their source. 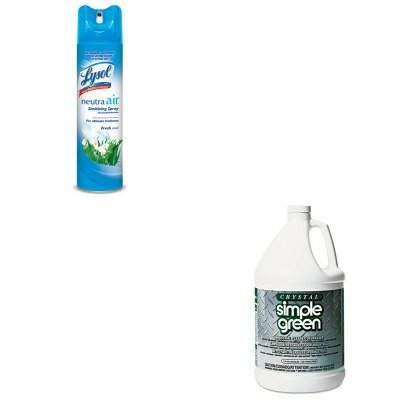 Unlike air fresheners that only mask odors, this sanitizing spray eliminates tough odors such as smoke, food, mold, mildew, bathroom and pet odors. Leaves a clean, pleasant fragrance. Scent: Fresh Physical Form: Liquid Application: Odor Control Capacity Volume: N/A.